This page details episodes of Minder previously released in the UK in VHS format during the 1980s and early 1990s - intended for collectors only we take you on a trip down memory lane. Episodes released in this period were from The Terry McCann Years. Since 2001, the series has been re-released, initially on VHS and DVD format and subsequently DVD format only. Details of current releases can now be found in our Minder shop. The videos shown here are in series/episode order, with releases in the 1990s shown at the bottom of the page. The order the videos are shown do not reflect release date. Only videos released before the year 2000 are shown on this page. 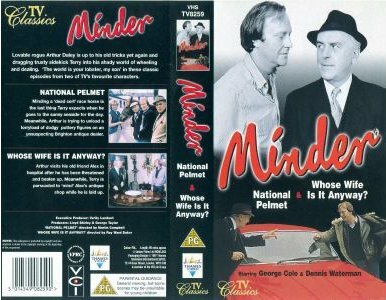 The cover stated : MINDER is one of the true classics of British Television. Now you can re-live the first ever episode. Wheeler-dealer Arthur (George Cole) and his Minder (Dennis Waterman) make the perfect team. Whenever there's a problem they can always find a way round it, and if there's non problem in sight they're sure to be able to make one! In Gunfight at the O.K. Laundrette, what starts off as a pleasant Italian family wedding ends up as a siege. Terry is held hostage and has to use all his ingenuity to get out of the mess. Superb entertainment from one of TV's funniest double acts ever. This video contains the first two episodes from the series one and was released by Thames Video Collection. Note the omission of the word 'A' in 'A Tethered Goat'. #2.1 National Pelmet / #2.2 Whose Wife Is It Anyway? This back to back video contains the first two episodes of series two. This video was released by Thames Video International/Video Collection International Ltd in 1991 as part of a WHSMITH Video Exclusive. When the series was first repeated on the UK GOLD TV channel in the 1990s, several episodes were made available to coincide with this. This is the second release of 'Minder On The Orient Express.